Transition Town Louth is an inclusive grouping of people who recognize the reality of Climate Change and the multiple environmental threats , but are determined not to cry doom and gloom into their beer but rather develop the transition to a sustainable community, resilient in an uncertain future, where the quality of life in our lovely part of the world is maintained and improved. To find out more about Transition Towns in general please take a look at the national Transition Town Website and Transition Culture. An excellent introductory read is What we are and what we do, by Rob Hopkins and Peter Lipman. To find out more about climate change Real Climate is the leading net resource for climate science. Tuesday 16th January 2018 7.30pm at The Aet Room, Aswell Street, Louth. April 2014 was the first month in which CO2 concentrations topped 400 ppmv at Mauna Loa. In April 2017 the record reached 410 ppmv, having risen more than 3 ppm in a year. More graphs from the Mauna Loa observatory here. The blue line, updated daily, shows the extent of sea ice. 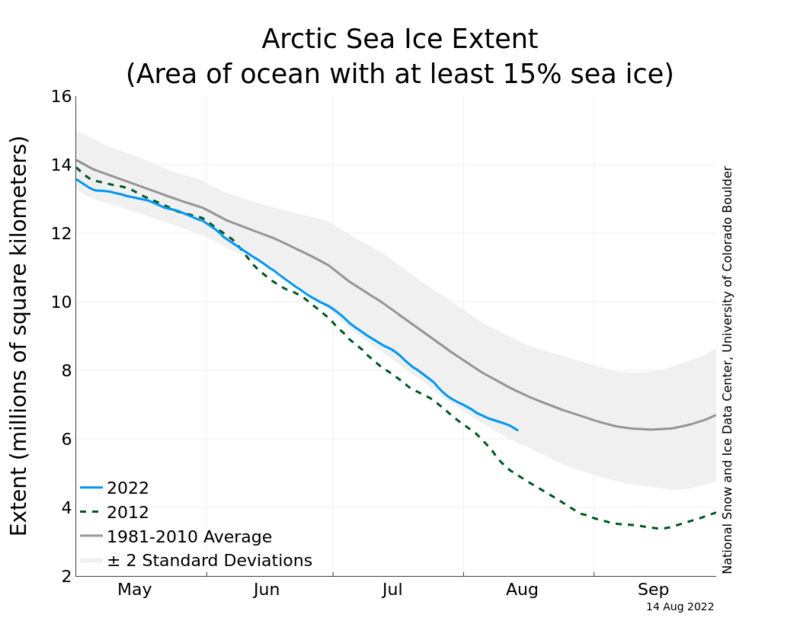 The extent of Arctic ice is, over several years, a good indicator of global warming. There is variability from year to year depending on the weather, storms breaking the ice up and spreading it about. After a strong melt year the ice regrows quickly as the water is not insulated by a layer of ice, so the following year is usually a weaker melt year. On the other hand, water has a much lower albedo than ice so absorbs more solar energy and reflects less. Open water therefore warms quickly in summer. The last few years have seen summer melting that far exceeds recent forecasts and raises the serious possibility that some global climate models are not giving the right results - with the errors all on the bad side. We are a sub group of Transition Town Louth, a voluntary organisation which exists to raise awareness on the impact of Climate Change and Peak Oil to our community. The aim of this sub group is simply to encourage and inspire the people of Louth to grow their own food. We intend to do this through the creation of community food gardens in and around Louth town. We hope the gardens will be a safe haven for everyone, young and old, to share in the community re-skilling of home food production and consumption. The plot behind Foundation House at King Edward's School will soon have been established for a year and a very successful year too. If you'd like to join in please do come along. More information from the Louth Community Food Gardens blog. Transition Town Louth has launched the area's own Freegle group. If you have something to give away or want something for free just sign up and get freegling. Transition Town Louth is acting as a focus for Landsharers in the area. Let us know if you would like to join Landshare and meet others to share ideas. The Minutes Page is where you can read minutes of meetings. There are now over 300 Transition Initiatives, Louth being the ninety-ninth. Transition Towns are completely autonomous organizations, linked by the Transition Network, which provides and shares ideas, resources and support. 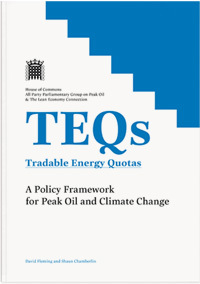 The common thread is a belief that energy security in the time following the peak in oil production and the risk of global warming, present threats so large that we will be forced to make a transition to a very different world from that to which we are accustomed. The Transition movement is driven by optimism and a determination to learn to adjust to whatever the future brings. Preparing in good time to meet the challenges is the wise approach. Our government, driven by the need to address the climate change issue and knowing that fossil fuels will be increasingly hard to come by, has a policy of reducing CO2 emissions by 80% by 2050. Even that drastic change may be understated as we compete for what little fossil fuel remains. This is not a target that can be missed but a reality that we are forced to accept. Indeed, the problems may press harder and faster than the government is prepared, as yet, to admit. It behoves each of us, as individuals or working through community groups and within local government, to accept that reality promptly, and to work together to make the transition as painless as we can, moving positively to a future where life may actually be better. Transition Town Louth is a grassroots grouping of people who share a determination to act. We are not concerned with debating whether global warming caused by man's actions is a problem, nor whether energy security is soon to be the most significant constraint on economic activity. We have accepted the issues, moved beyond debating the realities, and are ready for actions. Are you involved in a community project? Want people to know?